Presenting California as the nation’s largest farm state projects a massive agricultural behemoth, but its growth profile is really composed of many diverse units and locations, each massive in its own right. For example, grapes are one of the state’s largest volume commodities, but specifying the type of grapes produced will tell more of a geographic tale than you might expect. Center of production for sweet and tasty table grapes is in Kern County, specifically Delano, overflowing into neighboring Tulare and Fresno counties at a lesser scale. If your vineyard is in Napa it goes without saying that you produce grapes for wine, with your neighboring vintners in Sonoma and Mendocino counties unconsciously committed to the same output. But don’t overlook Temecula, center of wine grape production in Southern California. For grapes dried for raisins it’s back to the Central Valley, notably Fresno County, where a half dozen major packaging facilities process and distribute the tasty fruit shipped worldwide for enhancement of baked goods as well as snacking enjoyment, plus salad and dessert enhancement. But if you produce grapes near Lodi in the state’s upper Central Valley, the output might be for both or either the table or the glass. Your location there tells of an interesting transition from table to wine grapes. For years, the Lodi area was the center of production for the versatile and hardy Tokay variety, practically replaced now by more delicate and refined wine varieties. When considering other crops, an even wider state view is necessary. The nut crops, walnuts, almonds and pistachios, are produced in a wide area; pecans are more centralized in the mid-state. Consider potatoes and carrots, again Kern County is production central. Skip to avocados and find Fallbrook in San Diego County as a dominant location, shared with significant production in Ventura County. The San Joaquin and Central Valley vast west side is a mecca of production for a dozen crops, none larger than processing tomatoes. Harvest and hauling of the red fruit-vegetable occupies thousands of workers over the summer months. Processing facilities turning out catsup, sauces, soups and juices keep production facilities operating through the fall season. California’s mammoth dairy industry is not so much centered as it is spread over most of the state, from traditional dairies in the Petaluma and Turlock areas to those abutting population centers in bustling Southern California. Wherever cows congregate, dairies and processing facilities are sure to be nearby, offering employment and other economic opportunities year round. 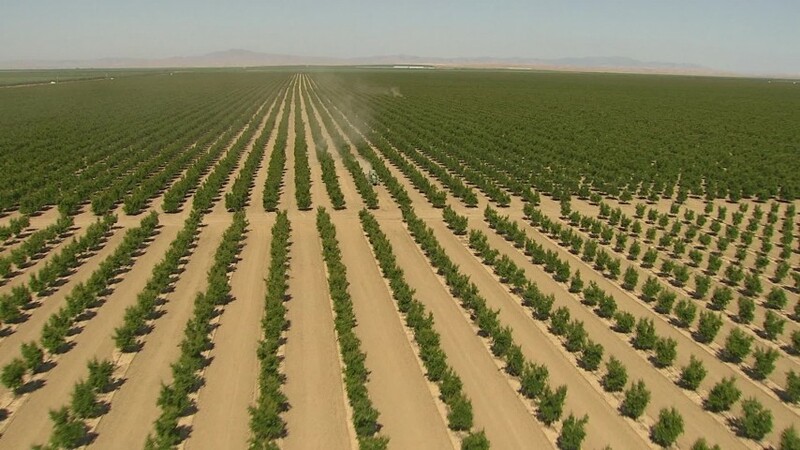 One of the state’s behemoth crops is citrus, bustling from (naturally) Orange County in the south through Fresno and Madera counties in the state’s center. Consumption of the wide variety of citrus fruits is enticing and worldwide, and the juice and concentrate markets are huge. Drawing the line that defines California’s vast array of specialty crops is controversial, but vast strawberry production is sometimes included, in the rolling slopes of Watsonville and Salinas or the gentle plains of Santa Barbara County. Less ambiguous are the widely spread production areas for the leafy greens, along the coast and in the interior. Onions, garlic, rutabaga, turnips and leeks, as well as traditional Asian vegetables have their place in the state’s amazing output of edibles. And most are grown where conditions and climate combine perfectly for their comfort – none more notable than horse radish, confined (thankfully, some say) to the Tulelake area at the state’s northern border. Like an athletic team, of which the state has had many – even this year – the working unit, in this case, agriculture, is composed of many crops thriving in many locations. The many parts comprise an attractive, profitable and winning whole.